Sept. 27th, 2011 - Zach Deputy releases his long-awaited studio album Another Day, today. The album captures Deputy's sensitive side, rich with soulful rhythm and blues numbers, ballads and the kind of 'feel good' enthusiasim that has made Deputy insatiably popular at music festivals and theater dates alike. A 'thoughtful singer and songwriter' (Palm Beach Post, 2011) Deputy can capture your heart as quickly as he does your feet. "He has so much soul in his music"
"A soulful rhythm and blues album rich with ballads and mid-tempo songs..."
With the help of Grammy-winning producer Scott Jacoby-- Zach Deputies new album taps into the spirit of Al Green, Taj Mahal and Stevie Wonder while retaining a classic sound and feel. Best described as soulful rhythm and blues, Another Day features 11 original tracks produced with Grammy award winning Scott Jacoby over just 5 days in Mission Sound Recording in Brooklyn, NY. To handle the ever-present Latin, Caribbean and African elements in Zach Deputy's backbeat and place them in the contemporary soul / pop format of the songs, Jacoby tapped Graham Hawthorne (Aretha Franklin, Harry Belafonte, Paul Simon, David Byrne) for the drum kit. Bassist Al Carty came into the studio after having played four church gigs that day. Despite the list of artists he has recorded or toured with (Lou Reed, De La Soul, Carrie Underwood, Gavin DeGraw), the church gigs alone proved that Jacoby was on the mark with this choice for the low end. 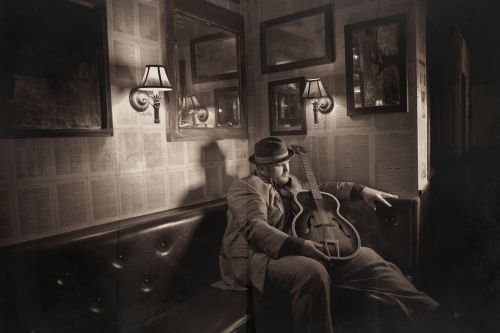 Zach Deputy is, after all, a soul singer whose music is underpinned by Gospel as much as by any other musical idiom. Equally at home in the Gospel tradition, pianist / organist Will Buthod (Jay-Z, Fat Joe, Alicia Keys, The Harlem Gospel Choir) completed the studio trio that fleshed out Zach's vision for the recording-- a vision made real by Jacoby's pitch perfect choice of accompanists. These four accomplished professionals met for the first time on the first day of recording and worked as if they were old friends with a common purpose.